The NanoBazaar is a pop-up initiative located in the centre of European cities. The aim of the activity is to offer visitors an opportunity to engage in dialogue with nanotechnology researchers on the pros and cons of nano-enabled products. The NanoBazaar displays real and imaginary products and invites visitors to give their opinion on these products. The NanoBazaar invited people to take a peek into the nanoworld as they were shopping or passing by. Every visitor was offered a card with a number of stickers to express their opinion on the products: whether they would like to buy it or not, and for which reasons (such as the price, need, novelty or health and environmental effects). Their responses evolved into a growing cloud of information around the products and was the starting point for discussions with researchers present at the Bazaar. Posters, banners and video presentations offer further background information on the history of nanotechnologies and recent advances. The exact composition of the exhibit varies from one city to another, embracing the cultural background, partners expertises and resources made available. The first was held on 20-21 Sept 2014 in Wroclaw, in collaboration with Nanonet, during the Lower Silesian Science Festival. 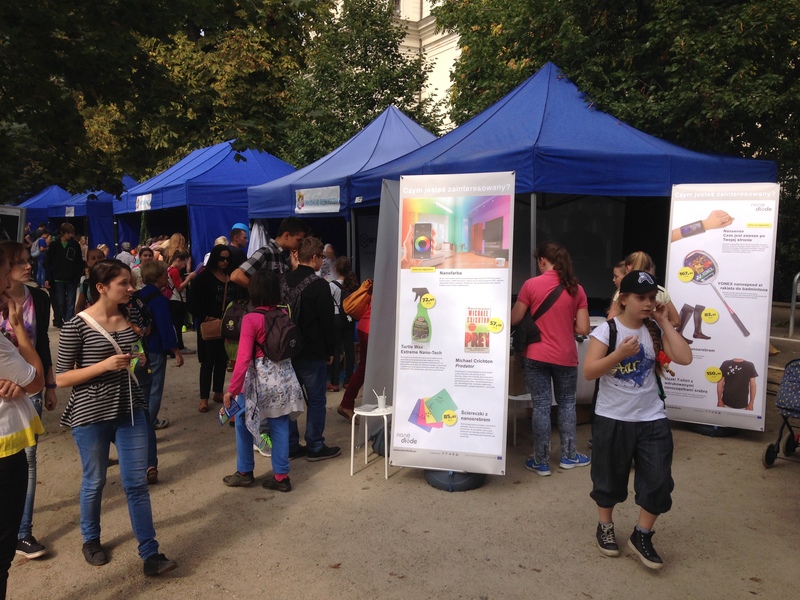 3.000 visitors attended this outdoor exhibition featuring live experiments, public debate, the NanoGallery and the NanoTube. The second was held on 8-9 May 2015 in Graz in collaboration with BioNanoNet and Werkstadt Graz. This event was held inside in a gallery. 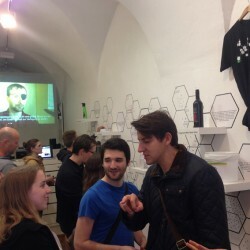 It was combined with the NanoGallery and NanoTube and engaged 250 visitors in in-depth discussions. The third was held on 3-4 October 2015 in Leuven in collaboration with KU Leuven, IMEC, UC Leuven–Limburg and City of Leuven. 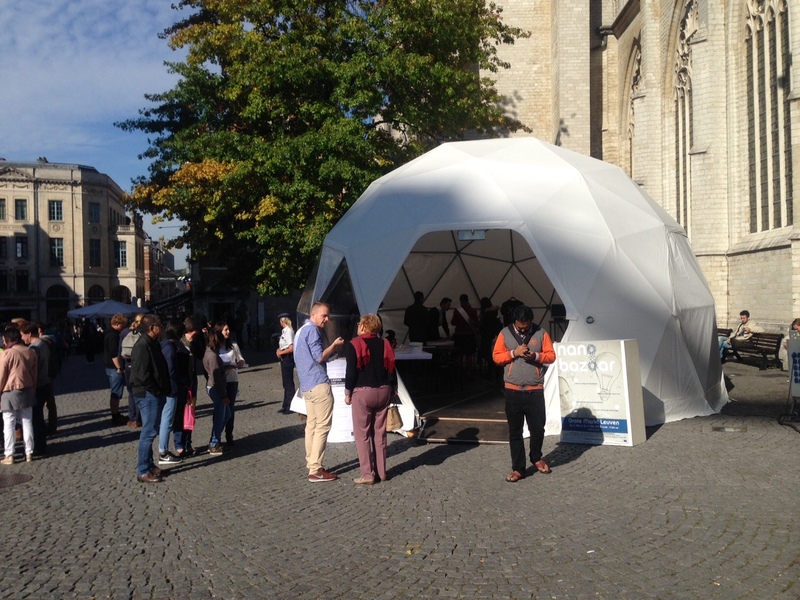 A specially built Buckminster Fullerene Dome was erected on the main square of Leuven, just opposite the old City Hall. 700 visitors discussed nanotechnologies with researchers. By using products from daily life, it was easy for people to get engaged with this topic. A playful interactive ‘survey’ was used to trigger people’s attention, to share information, to learn more about this topic, to form their own opinion, and to discuss this with the experts around. This ‘information cloud’ also made people aware of others’ people opinions and thoughts. Through the discussions, both researchers and citizens acquired a more nuanced understanding of their expectations, hopes and concerns on nanotechnologies now and in the future. These discussions also provided hints into public perceptions: visitors considered medical applications and renewable energy as the most interesting applications of nanotechnology. They were curious about new things (fictitious Nanowine and NanoPaint were the most hotly debated topics) but critical towards possible side effects. Representatives from Universities and Institutes have shown there interest in this innovative communication tool. The NanoBazaar was developed as part of the public communication activities within the NanoDiode project. These activities sought to transcend binary positions ‘for’ or ‘against’ nanotechnologies, and instead present an all-partial perspective, displaying a range of visions on the ways in which nanotechnologies could impact our society, without dictating which perspective is more relevant or important. 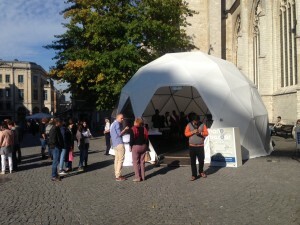 • Pop-up initiatives organised in 3 locations (Wroclaw Poland, Graz Austria, Leuven Belgium). • 46 contributors: scientists, students and hosts. • 2 radio interviews, publicity in print, newsletters and social media.